So far, we’ve believed that reef-building corals around the world are hugely vulnerable to rising ocean temperatures and can suffer bleaching as a result. But, scientists recently discovered a coral species that can actually seem to adapt to warmer weather. Remember your last trip to the sea? You probably recall how the water around you felt warmer the closer to the beach you were and colder the farther you swam out to sea. And while you can move from colder to warmer water and the other way round, corals cannot. They stay put in their surroundings. So, researchers decided to look at how the same coral species can deal with different water temperatures. 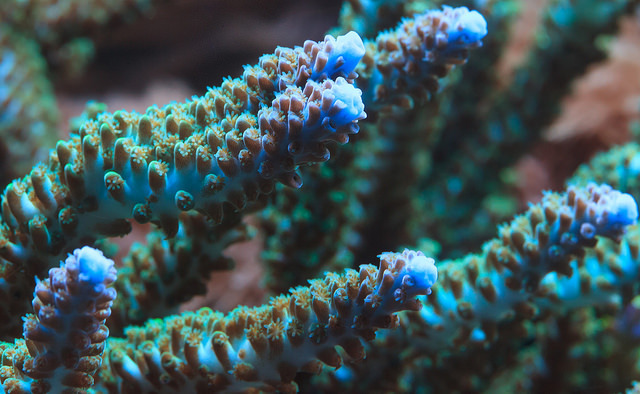 Along the coasts of American Samoa, coral Acropora hyacinthus lives and grows on the reefs. Water levels shift due to the tides, leaving the corals along the flatter beaches covered with less water during low tide. This water can be heated up more easily by the sun, periodically exposing the corals to a warmer environment. Stephen Palumbi from the University of Stanford and his team collected both: Acropora hyacinthus corals from flatter areas and also ones from the deeper, cooler sea. Next, they put all the corals in so-called “stress tanks” where the scientists could deliberately alter water temperature. When substantially heating the water in the stress boxes, the researchers made a crucial observation: the corals collected from the deeper, cooler sea died. But the ones collected from those exposed to periodically warmer areas survived. They were already used to warmer temperatures and changing temperatures and thus able to adapt, researchers concluded. What do you expect when you are visiting a climate protection project, supported by the United Nations World Tourism Organization (UNWTO)? I was pretty sure to find some supporting staff members who are well payed to do their green jobs. But what I found at Pangandaran, a bathing resort at the Southern coast of Java, was a lot more – a large number of Indonesian people are taking action themselves, as volunteers in the project. The motivations may be different, but all of them agree that something has to be done, sooner, not later. Apip Winayadi, Environmental Activist from DW_Global Ideas on Vimeo. Encih Sarsih, Elementary School Principal from DW_Global Ideas on Vimeo. Bapak Iwa, Fisherman and Environmental Activist from DW_Global Ideas on Vimeo.